Recently I came across a fresher recently recruited in my company doing a boring and repetitive work of Find and Replace, doing it manually. He was searching for a particular keyword in the code and replacing a couple of line with the new piece of code. He was not using the VS.Net’s Find and Replace box because he needed to search for a Pattern and replace it with another pattern. He was not able to find a better and more accurate way of doing the same. So I thought of helping him and others who find Pattern search complicated by writing this blog and showing the power of Regex Patterns. 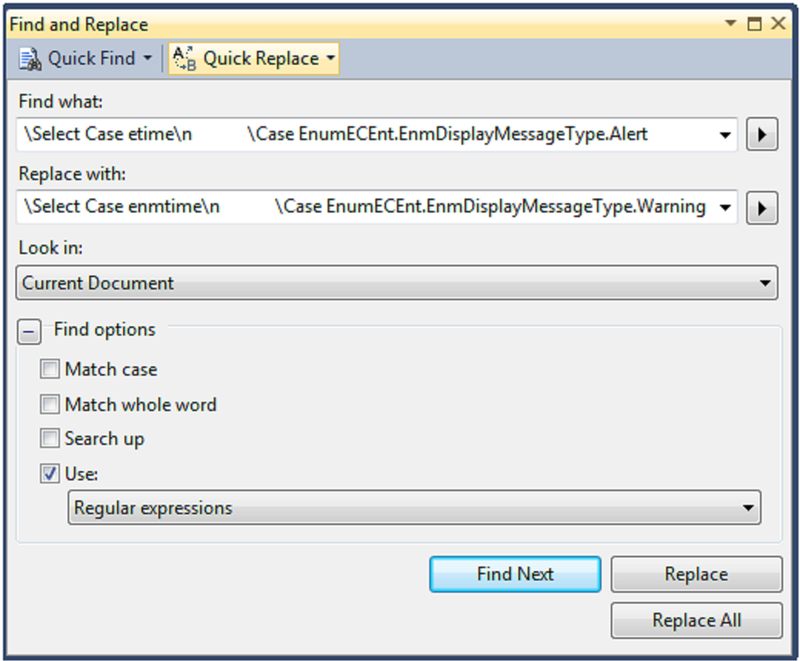 Enter the relevant text in Find what and Replace with Text boxes as shown above. We can then search and replace as usually. So wasn’t this really simple? By using just a couple of Regex keywords we were able to do a complicated Find and Replace which could have required tedious manual effort. 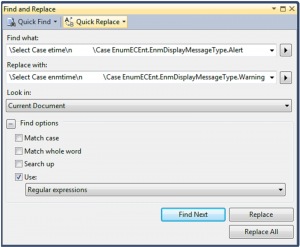 This entry was posted in VS.Net 2010 by Hemesh. Bookmark the permalink. Thank you Carol, will try to.